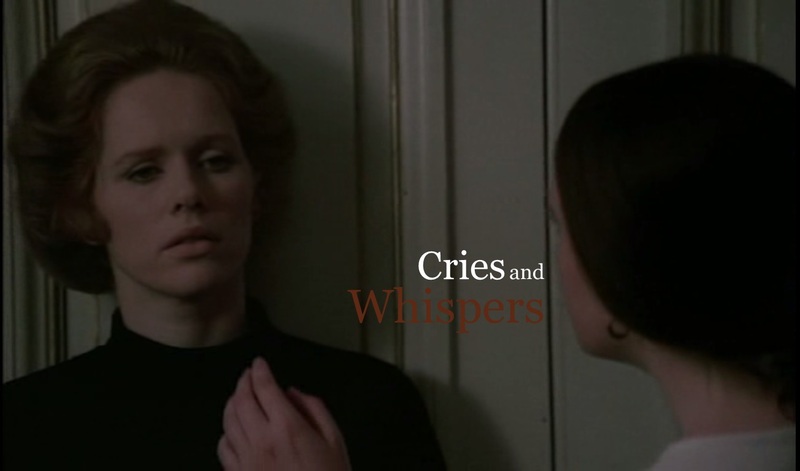 This week on Hit me with your best shot we tackled a film by the esteemed Ingmar Bergman - "Cries and Whispers". This was my first viewing of the film and as expected, I found it to be a fascinating, singular piece of work. It even resonated with the Academy, managing some major nominations (Best Picture, Best Director, Best Original Screenplay etc.). In my case, I was entranced by its ability to be so austere and yet highly emotional at the same time. 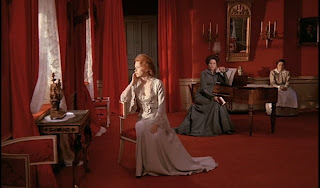 The 4 actresses (Harriet Andersson, Kari Sylwan, Ingrid Thulin and Liv Ullmann) are especially fabulous in this regard. Of its 5 nominations, it managed to win Best Cinematography and it's certainly deserved. For this series, the image that stood out to me most is said to have deep thematic meaning for the film (the use of the colour red). I however, chose it as my best shot for purely aesthetic reasons. 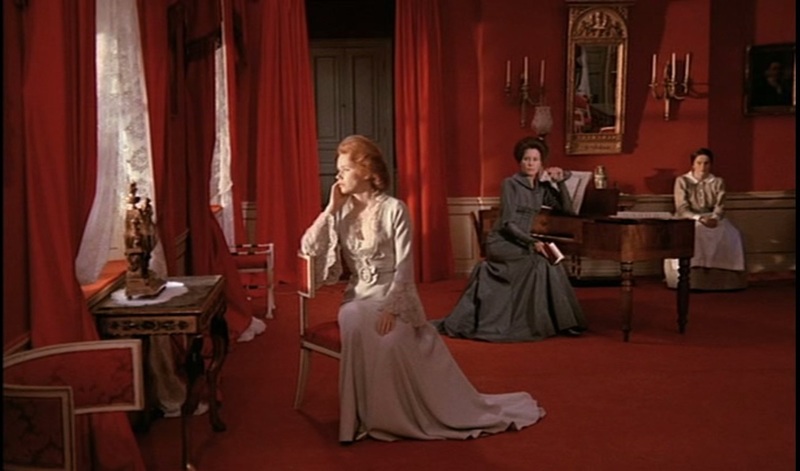 I love everything about it - the framing, the dresses, the actresses' poses, the decor. It looks like a high fashion editorial and strongly conveys Bergman's artful vision. After much deliberation this weekend, I finally decided on my choice for "Movie of the Week". In a showdown between a pair of esteemed genre flicks by Asian directors, Joon-ho Bong's "Snowpiercer" just barely edged out Gareth Evans' "The Raid 2". In the end, the deciding factor proved to be the unique ambition of the former (as opposed to the entertaining but familiar nature of a sequel). That ambition comes from the gonzo sci-fi premise. The film tells of a dystopian future where an experiment to combat climate change has gone wrong and caused the world to freeze over. There is no more life on earth, except for the few on board the Snowpiercer, a train that circles the globe in perpetuity and provides a fully-functioning living environment. As with any cinematic dystopia, the arrangement isn't fair to all, as the train is divided by class. The upper class stay towards the front, while the underprivileged are relegated to the desolate tail, with no hope of advancing their status. The arrangement stays stable for the most part, until the disadvantaged decide to revolt, staging a coup d'etat of sorts to get their chance at the happiness afforded to the elite. As the action unfolds, the incredible vision of director Joon-ho Bong is quickly realized. The tone he creates is an interesting mix of styles. Firstly, the quirky characters (Tilda Swinton's defiant Minister Mason) and unusual set details (the strange protein blocks that are used as food) provide a touch of Terry Gilliams-esque whimsy. In addition, the visceral violence and extreme levels of human depravity remind you of the director's roots in Korean cinema. On top of all this, the high quality visuals and recognizable faces give it a compelling Hollywood sheen. It all comes together to make the film constantly interesting. The stylistic flourishes are certainly inspired but perhaps more importantly, everything's in service of a very thrilling ride. These thrills are rooted in the film's remarkable efficiency. The script sets up the film's rules succinctly without long exposition and manages to find intriguing digressions within its obstacle course trajectory. In addition, the main cast of protagonists (Chris Evans, Octavia Spencer, Jamie Bell, John Hurt, Kang-ho Song) are uniformly strong, nailing each emotional and character beat with pointed urgency to keep things moving. As a result, the film maintains a high energy that keeps you on an adrenaline rush until the poignant climax. The film's setting may be confined and claustrophobic but it definitely feels epic in every sense of the word. In summary, there's a lot to appreciate in "Snowpiercer". Even when the tonal shifts become admittedly irksome, it still invites me to always watch, listen and ponder with keen interest. It's the rare big-budget action movie that feels truly one of a kind. This week on the roundtable we took on the man, the myth, the legend. Click here to find out what we had to say about Marlon Brando. Sounds grim right? After watching the trailer above, it seems like the tone could be overly maudlin. Whether it's good or not, I'm more interested to see how it performs at the box office. When a concept finds success (e.g. superhero movies) the studios are likely to churn out more films in the same vein. Will the "young lovers face death" become the next fad? Perhaps. The fact that these films are backed by major studios ("The Fault in Our Stars" was distributed by Fox) with wide releases means that these are expected to be big commercial properties. If I Stay will be released by Warner Bros. on August 22nd. This week's assignment for Hit me with your best shot is a recent film that has thrilled many cinephiles since its debut nearly a year ago. 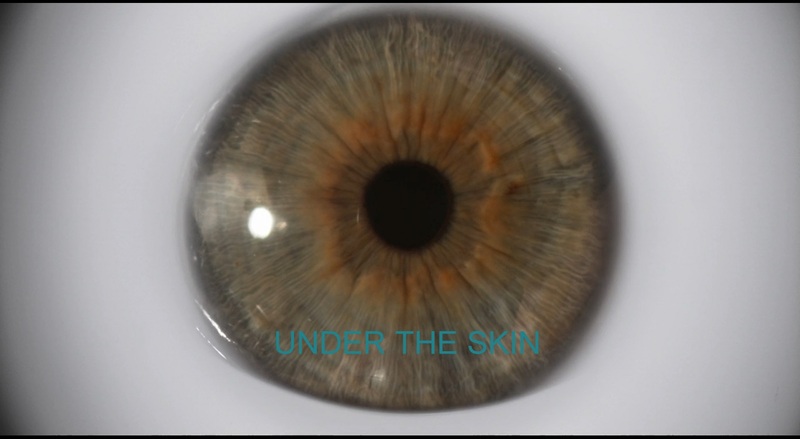 'Under the Skin' is the latest feature by Jonathan Glazer and it stars Scarlett Johansson as a mysterious predatory woman who roams the streets of Scotland. This was my first encounter with the film and man, I was captivated. Much of that is due to the mesmerizing performance by Johansson, in a role that plays well to her otherworldly beauty and effortless magnetism. It's hard to think of anyone else in Hollywood who could have pulled off this role better. She's dangerous in the worst way (i.e. she's so irresistibly appealing!). I never once questioned why any of her victims would follow her into that dark creepy lair. For my best shot then, I selected an image that relates to the power of Scarlett Johansson in this movie. Back in the 1997 awards season, a foreign film landed on American shores that seemed to universally capture the hearts of the nation's critics. Among the various high profile groups, it was either winning the Foreign Language Film award (BFCA, OFCS, NBR), or finishing in 2nd place (NYFCC, LAFCA, Boston Society of Film Critics). No, it wasn't a harrowing war drama or an obtuse art film. 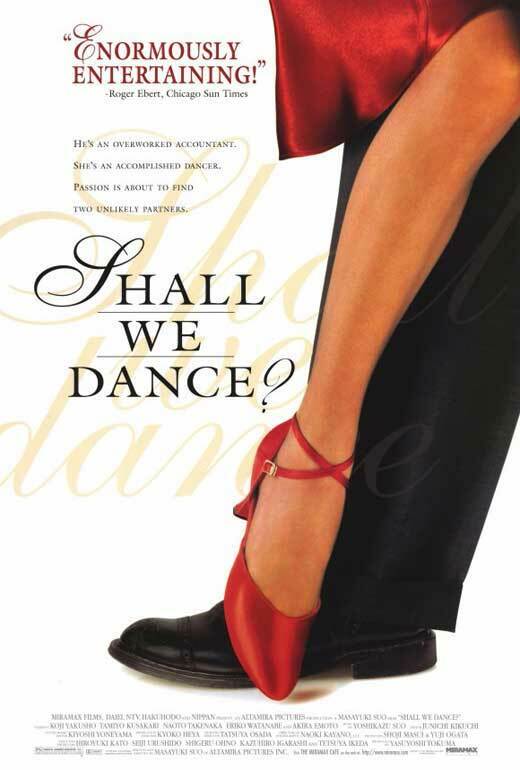 Rather, it was an unassuming Japanese drama about ballroom dancing titled "Shall We Dance?". If the name sounds familiar, then you've perhaps seen the 2004 American remake starring Richard Gere. As you know, that one wasn't as well-received by this one certainly was. Both films tell the story of an overworked middle-aged man who has lost his zest for life. In this original version, the lead role (Shohei) is played by Koji Yakusho. One day during his regular commute from his accounting job, he spots a beautiful young woman (named Mai) in the window of a dance studio. Staring wistfully into the distance, she has him entranced and he soon devises a way to meet her. Eventually, he signs up for dance lessons in her studio, hoping to use the opportunity to get to know her better. Of course, she doesn't immediately fall at his feet and Shohei must then save face by seriously committing to his dance training. Before the film gets into the meat of the plot, it sets the stage with a voice-over narration. In it Shohei explains Japan's conservative culture, whereby couples don't engage in public displays of affection. As such, ballroom dance is frowned upon for the expressive physical and emotional connection it requires. Even worse is when it's done between strangers. At the end of the narration however, Shohei notes that many Japanese are secretly fans of ballroom dance for the joy it brings. For much of the film, this joy is clear. It's evident in our lead character whether he's energetically cycling down the street or blissfully dancing in the rain. Sharing the sentiment is his co-worker Tomio, another student at the studio who is a ballroom dance fanatic. Played by Naoto Takenaka, he provides the film's comic relief. Mugging away with a tacky wig and exaggerated gestures, he lacks the skill but has all the enthusiasm. Together with other students and instructors (Reiko Kusamura is particularly lovely as the kind, mature Tamako) they successfully convey the exhilaration that the film tries to get across. To further establish this, the person in the studio who is least keen - Mai, due to events in her past - is also the one who is most unhappy. Where the film does falter for me though, is in exploring the social effects of Shohei's new hobby, as stated in the opening narration. Despite his romantic desires, Shohei is in fact a married man (with a daughter too). Due to the stigma of ballroom dance then (and the potential infidelity of course), he keeps his endeavours secret from his wife. It's a seemingly important aspect of the plot, as his absence does not go unnoticed at home. It's therefore curious and disappointing that the domestic drama (the source of his discontent in the first place) isn't addressed significantly until he's well on his way to becoming a champion dancer (it is a dance movie after all). Instead we spend a lot of time watching Tomio's eyesore dancing, time which could have easily been replaced to confront Shohei's family life just a little bit. Perhaps this was never the focus of the film, but it feels like a missed opportunity to fully enlighten the audience to the unique implications for this man, in this culture. Having now watched the film, I'm still surprised that it became such a critical darling but I can see why it would inspire widespread appreciation. It doesn't satisfyingly fulfill all of its potential, but it gives you just enough surprises to feel fresh and compelling. Most importantly, it successfully translates the joy of dance to the viewer and leaves you on a high. On the latest Best Actor Bloggers Roundtable, we looked at the Oscar-winning performances of Fredric March. You can find that discussion here. I don't post random film news very often, but this one was too good to pass up. We all know that red carpet glamour and publicity are equally as important as the actual performance when it comes to Oscar campaigns. Just look at Lupita's slaying of the red carpet last year for example. Well, it looks like the team behind "Dawn of the Planet of the Apes" are giving their star the similar treatment. 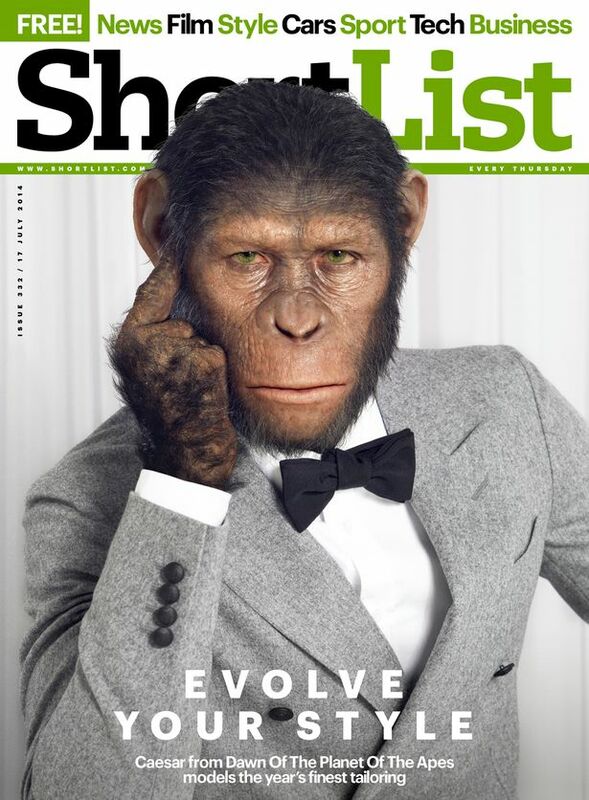 Yep, Caesar is out there gracing magazine covers and putting us mere humans to shame! Many think that the Andy Serkis Oscar talk is just wishful thinking, but this is the kind of buzz that can keep him in the conversation. At the very least, the 2nd installment will hopefully rectify the shocking Visual Effects Oscar loss of its prequel. Hit me with your best shot returns this week and it's a Batman celebration! 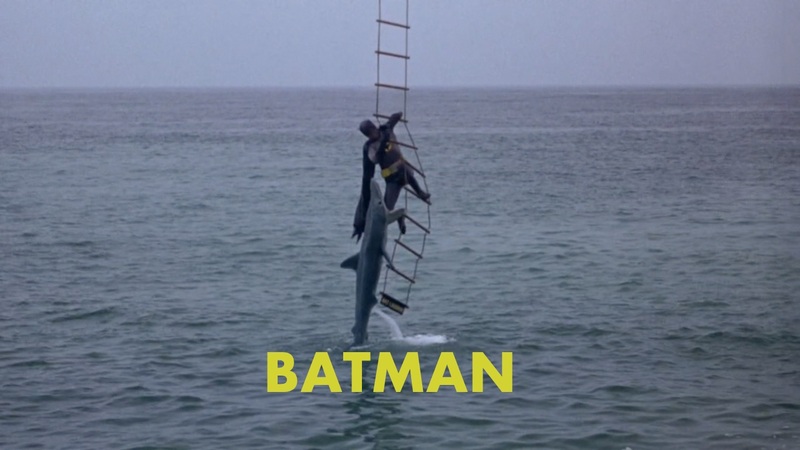 For this assignment, Nathaniel had us select any of the 9 theatrically released Batman movies for our best shot. I decided to go with one that I hadn't yet seen - "Batman: The Movie" from 1966. Having now experienced this strange film, I now fully understand the extensive transformation that the comic book/superhero movie genre has undertaken. Under the scrutiny of modern eyes, this film provides a unique challenge. It's the rare occasion where any criticism I can throw at the film could just as easily be interpreted as compliments. 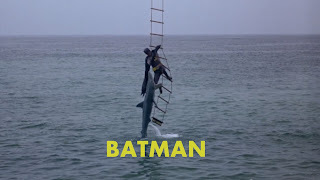 "Batman: The Movie" is dumb, phoney and slight...but that's exactly what they were aiming for! From the very beginning, it's clear that you shouldn't take this very seriously. The performances are just so chipper and tongue-in-cheek. Really, the events of the movie are just an elaborate private party game and you can't convince me otherwise. Despite the relentless stupidity, it's a fun watch (that bomb disposal scene is comedic brilliance) and I eventually began to appreciate its warm embrace of its comic book origins. This lead to my pick for best shot below. This week's top film is one of this summer's biggest triumphs - "Dawn of the Planet of the Apes". A sequel to Rupert Wyatt's unexpected gem of 2011, this is a film that certainly had a lot to live up to. 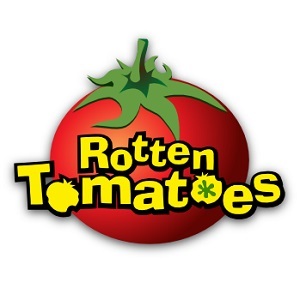 With a new director at the helm (Matt Reeves), the challenge was to repeat the thought-provoking mainstream entertainment of the predecessor. After seeing the end product, I can safely say that it achieves its goal, as this film is nothing short of a work of art. 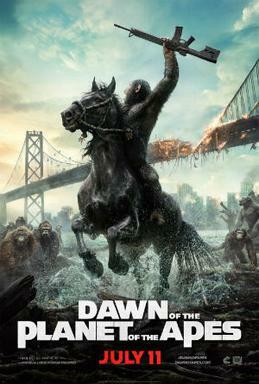 "Dawn of the Planet of the Apes" opens with a prologue that is a stunning example of world-building. In an extended scene that recalls "The Lion King", our protagonist Caesar ushers in his newly born son into the world. It's set in a future world where scientific experiments have lead to the evolution of apes, while decimating the human race. Under the leadership of Caesar, these apes have settled into their own civilization, creating a close-knit community in the woods. They are completely separated from the few remaining humans, until one day a group of explorers discover their enclave. The meeting stirs up old resentments from both sides and much to the disappointment of Caesar, it seems like war is inevitable. This war is the film's raison d'être. The first film was the origin story, laying the foundation for the characters and their conflicts. Now it's time to see these intelligent, powerful apes do battle with the weakened human race. Yet despite this inevitable destination, the film takes its time to get there. The audience may have come for the action, but Reeves is intent on giving us something more. One thing that Wyatt did very well in "Rise", was to instill our empathy with the apes. It's something that Reeves latches on to quite early here and expands on tremendously throughout the narrative. The aforementioned intro is striking in its ability to show the beautiful grace and "humanity" of these evolved apes. The image of various friends/relatives caressing a mother (Caesar's wife Cornelia) as she nurtures her baby stands out in particular. The saying "it takes a village to raise a child", is one that this community clearly holds dear. There are many striking images throughout this film, as Reeves expresses a stunning directorial vision. From start to finish I marveled at the impeccable visual storytelling on display. There's no doubt that this installment is a stronger feat of directing. Reeves' keen eye greatly enhances the script too. With the predictability of action-oriented summer movies, one of the greatest challenges is trying to stand out amongst all the calculated studio product. Indeed, the basic concepts of this film have already been explored just from this summer alone! In "Godzilla" we saw another cautionary tale about man's effect on nature and "X-Men: Days of Future Past" delved into the apocalyptic "us vs them" scenario quite well. In this film, we get all of that with even more memorable images that are linked with deeper themes. No other summer blockbuster has conveyed the range of themes (compassion, family, loyalty) here with as much clarity and purpose. From the fascinating interactions between man and ape (in addition to dissenting factions within these groups) to the terrifying pandemonium of the climax, the film elicits strong feelings of human shame. This may be a work of fiction, but just a glance at various high-profile documentaries like "Project Nim" and "Blackfish" will show that there's something fundamentally wrong about the way we treat animals. Those same sentiments are conveyed beautifully here, through the superb motion-capture performances of these complex ape characters. The humans are fine, but Caesar (Andy Serkis), Koba (Toby Kebbell) and Blue Eyes (Nick Thurston) are the real stars. In "Dawn of the Planet of the Apes", Matt Reeves has created a film that improbably improves on the original in many ways. The directing, editing, visuals and acting continue to be of the highest calibre. The initial stages may feel overly solemn for a film centered around talking apes, but once it hits its stride, you'll find a film that is rich in thought and appealing aesthetics. When coming up with my list of Most Anticipated Films of 2014, one film that stirred my interest was Wally Pfister's directorial debut "Transcendence". After years of working closely with Christopher Nolan (one of my all-time favourite directors), I figured he must have learnt something from that modern genius. Sadly, that wasn't the case as this film turned out to be a major disappointment. On the surface, it's easy to see why Pfister would be interested in this script (a 2012 Black List honoree no less). This story about a scientist named Will Craster (Johnny Depp) whose consciousness gets uploaded into the powerful artificially intelligent computer which he created, is just the kind of material that he worked on for years with Nolan. Based on complicated science surrounding "technological singularity", it's a premise that one could envision Nolan exploring with exhilarating results. Of course, this isn't a Nolan film and Pfister's shortcomings as a director (as well as Jack Paglen's poor writing) are self-evident here. "Transcendence" springs into motion following a lecture where Will Caster (Depp) explains his project (along with his wife Evelyn, played by Rebecca Hall) about creating sentient technology that surpasses human intelligence. 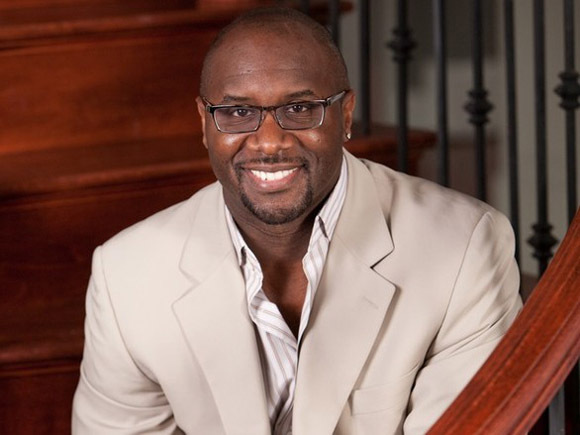 In the aftermath of his presentation, he is shot in protest by a group called R.I.F.T. (Revolutionary Independence From Technology) who oppose the "godlike" intentions of the technology. 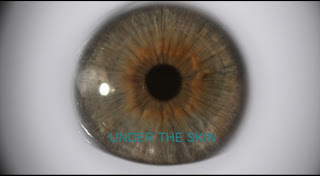 Discovering that the bullet is laced with radiation poisoning, Evelyn decides to upload his consciousness to preserve his "being" before he dies. With the reluctant help of fellow researcher Max Waters (Paul Bettany), the plan works, effectively bringing Craster back to life. Hooked into our worldwide network of technology thereafter, he becomes increasingly powerful. As with any sci-fi thriller, there are inevitable complications. It starts out well, as Will and Evelyn invest in a highly advanced technological facility in the desert, improving various fields of science, like biology, nanotechnology and medicine. However, when Evelyn realizes that his powers extend to analyzing people's minds, she realizes that they may have gone too far. Well, she was right. Like this Transcendence project, the script overextends itself to absurdity. Mainly, it takes a lot of narrative shortcuts (like lazy usage of "X" years later to skip the explanation of the technology) that keep the audience at a distance from the core premise, no matter how fascinated you may be. For a film that is rather long (about 2 hours), there's a perplexing lack of actual "stuff" happening. By the time you reach the point where there's a fairy dust substance being dispersed throughout the world, the film starts to feel more like magical fantasy than intellectual science fiction. Apart from these conceptual absurdities, the film's greatest offence is its false advertising. Now, I won't go as far as suing the filmmakers but a plot that involves an assassination attempt, revolutionary technology gone awry and FBI investigations, has no excuse for being this dull. In fact, one would find it difficult to even consider this a thriller, as its trailers would suggest. Throughout the film there are many mentions of impending danger, yet we see no urgent conflict until the final act. Somehow Pfister expects to keep our attention without giving us anything exciting to engage with (visually or thematically) for the majority of the running time. To add further insult to injury, the film is capped by a Nolanesque poignant ending that is completely unearned. With little engagement with the science or the dynamics of the central romantic relationship, it leaves you annoyed rather than invigorated as clearly intended ("look, isn't this clever?"). No thanks, I'll take "Inception" and its spinning top instead. There's no denying that making the switch from cinematography to directing is a major step, and I commend Wally Pfister for giving it a go. However, the bland outcome of this effort indicates that he may not be up to the task. The good news is that he remains a talented cinematographer, so this is just a bump in the road in an otherwise impressive filmography. Maybe with some more mentoring in the art of directing he can actually make a good film from the director's chair in the future. This week on the roundtable we discussed the Best Actor wins of Jack Nicholson. Join us at Andrew's site. This week's top pick is a film that was quite a surprise for me - "Non-Stop". The latest in a series of tough guy roles for Liam Neeson, many would point to this as simply another paycheck role in a disposable movie. Honestly, these assumptions are probably correct. For me though, there was something fundamentally enjoyable about this conventional cash cow. Over the years, it seems I've developed an affinity for films and TV series involving disaster-struck planes as crucial plot element ("Lost", "Flight", "Flightplan" etc.). It's a rather strange situation, especially considering the fact that I travel often. Somehow, I find a sense of "comfort" in these scenarios, especially those where the flight dominates the plot. There's just something about the dramatic tension of those claustrophobic confines that I always respond to. Likewise, I get a cathartic thrill out of the inevitable heroic landing. At the basic level then, "Non-Stop" was bound to give me some satisfaction. Still, there were many ways that "Non-Stop" could have gone wrong. The story is your classic whodunit mystery where one man must find the perpetrator before it's too late. In this instance that man is Liam Neeson, who plays an air marshal aboard a hijacked transatlantic flight. As expected, it all hinges on an exorbitant ransom (this time it's $150 million) that the criminal demands for rather silly reasons. Now if you're expecting something smarter from the script then you're likely to be disappointed. However, if you can fully suspend your disbelief you'll likely find this to be an entertaining ride. The biggest draw is a compelling cast featuring talented actors like Julianne Moore, Scoot McNairy, Michelle Dockery, Nate Parker, Corey Stoll, Lupita Nyong'o (a hilariously tiny role) and of course, our resident badass Liam Neeson. They all pull their weight by keeping you engaged with the characters and their plight. The film is also well-paced, with hardly a dull moment as Neeson tries to solve the mystery. The script behind this mystery may not be extraordinary, but there's something gratifying about its lack of ambition. Sometimes a film's ability to simply avoid being "bad" (rather than strive for greatness) can make for some of the most rewarding experiences. A number of this year's summer movies seem to be succeeding largely because of this reason ("Edge of Tomorrow" for example) and I think the same applies to this earlier release. Like many other films of its ilk, "Non-Stop" will undoubtedly leave you scratching your head at the motivations behind the climactic reveal. What separates it from those countless other failures however, is its ability to keep you constantly entertained so those ridiculous plot twists don't matter. Really, with Liam Neeson in top form, what's there to complain about? Earlier this week, I commented on the propensity for moviemaking trends to repeat themselves in terms of the scale of blockbusters. Upon watching the 2014 film "G.B.F." (an acronym for gay best friend), I'm now also reminded of the propensity for filmmakers to borrow elements from other films that came before. In the case of this film, it's the highly regarded "Mean Girls" of 10 years prior from which it draws its influences. Unfortunately, in trying to replicate that film's success, "G.B.F." fails to carve out its own identity, even though its premise suggests something new. Said premise of "G.B.F." is a high school coming out story. It centers around a reserved young man named Tanner (Michael J. Willett), who reluctantly gets outed by his school's Gay-Student Alliance in their quest to recruit the first gay person into their club. Unfortunately for them, a trio of popular girls have other plans. As prom night approaches, they all compete for Tanner's affections, hoping that a gay best friend will increase their chances of winning prom queen. Unable to settle it fairly, they devise a win-win situation where Tanner befriends all three in exchange for protection from the school bullies. Of course, complications arise as the girls struggle to share their new accessory and Tanner's new clique puts a strain on his relationship with his former best friends (one of whom is also gay). On paper it all sounds like a fresh perspective on the high school comedy, placing a gay character front and center. It seemed like an opportunity for some interesting insight into the young gay perspective but sadly, the film feels like a rehash of storylines we've seen before. The most apparent comparison is of course, "Mean Girls". There are similar plot points and the characters are almost the same - a "fish out of water" protagonist, three popular girls (the pretty but mean queen bee, the ditzy one and the undervalued one who's jealous of the queen bee), the unpopular best friends and the concerned teacher with a heart of gold. It doesn't help that the film also actively acknowledges "Mean Girls" too, referencing Lindsay Lohan and the "things I've learned" prom speech. Sadly, the film didn't steal any of that film's finer qualities outside of its basic structure. From the first scene there's a fakeness to the setting that makes the film hard to take seriously. There's just no sense of place (sometimes it feels like a liberal northeast school and other times it could pass for a conservative red state). It also lacks visual flair, with hardly any physical comedy to stimulate the senses. Sorry George Northy (the screenwriter), but there's nothing inherently funny about two gay boys having a private bedroom dance party. Without the sight gags, it tries to compensate with the writing, but it lacks the invaluable wit that Tina Fey gave to her film. I can count the funny lines of dialogue on a single hand. As such, everything just falls flat and that includes our protagonist. One could argue that Willett's bland acting is intentional (he doesn't conform to the effervescent gay stereotype) but he seriously brings down the film's energy. Tanner's dullness further exacerbates the film's "Mean Girls" problem. Specifically, the most intriguing characters end up being the three girls rather than the central character. Queen Bee Fawcett is smarter than she appears, token black girl Caprice is a champion of equality and Shley is a conservative Mormon girl who proves to be surprisingly tolerant and adventurous. They all have more depth than Tanner, who's only defining characteristic seems to be his sexuality. Yet still, the writing refuses to commit to these characters, only allowing Fawcett to get full character development. There's a fascinating opportunity with Caprice (at one point she's offensively referred to as a sassy black friend) to mirror Tanner's experience with societal pigeonholing, but it's never properly explored. Meanwhile Shley is saddled with all the narrative cliches of being ditzy, drunk and sexually frustrated. It's evident that the script should have narrowed its focus on either the gay teen's coming of age or the politics of high school girls running for prom queen. There's a worthwhile story to be told from the idea of "G.B.F. ", but this film fails to deliver it. Instead, this is nothing more than a poor man's "Mean Girls". If you count yourself as one of the many fans of that film, then I'd recommend watching that rather than wasting your time with this uninspired effort. After our short break, the Best Actor Roundtable is back with a bang. This week we discussed the merits of the one and only...Daniel Day-Lewis! Click here for the full post.